Godrej Horizon: Welcome to a world of supreme luxury and comfort where the sky is the limit! Pune is a beautiful city that is known for its lush greens, low air-pollution, peaceful atmosphere, education hubs, MNCs, entertainment zones and more. Being one of the most loved cities in the country, Pune has a lot to offer its residents. The real estate industry in Pune is booming today with a number of residential and commercial projects in different parts of the city and its outskirts as well. Godrej Horizon is a new residential project in Pune by Godrej Properties that offers a world of luxury and comfort from start to finish! Extended over vast acres of land, this development contains 4 spectacular towers that offer 1BHK, 2BHK, as well as 3BHK luxury apartments with large apartment areas that provide beautiful luxury space for all your needs and requirements. Godrej Horizon Pune is a pre-certified IGBC Gold Green Homes development that offers the highest level of luxury and comfort for a lavish life filled with peace and serenity! The apartments are spacious, provide beautiful natural lighting, cross ventilation and contain high-end fittings & fixtures, high-quality flooring in every room, elegant kitchens with superior platforms and multiple provisions, private gardens, decorative doors, large balconies and windows providing jaw-dropping views of lush greens and the horizons of Pune,hi-tech safety features and the list just goes on. This residential development also offers a wide range of world-class external amenities that will blow your mind! With something special for you and every member of your family, experience a comprehensive lifestyle that will fill you up with joy. The external amenities include a clubhouse for recreation, swimming pool, meditation centre, hi-tech gymnasium, jogging track, internal/external sports facilities and a play-zone for your kids, day care centre, dedicated area for senior citizens, multipurpose hall, large landscape courtyards, cycling track, wide open space of 70,000 sq. ft., efficient car parking, power back-up for emergencies and well-trained security. This development also takes up rain water harvesting and organic waste management to help the environment. This development is where you can experience life like never before! Located at Undri in Pune, Godrej Horizon NIBM Undri has a number of your daily and emergency landmarks in close proximity and offers a life of convenience that is simply outstanding! Places like schools, colleges, institutes, malls, shopping centres, entertainment zones, clubs, pubs, lounges, cinemas, cafes, restaurants, banks, ATMs, hospitals, medical centres, public transport and a lot more can be found and accessed in the shortest amount of time possible. 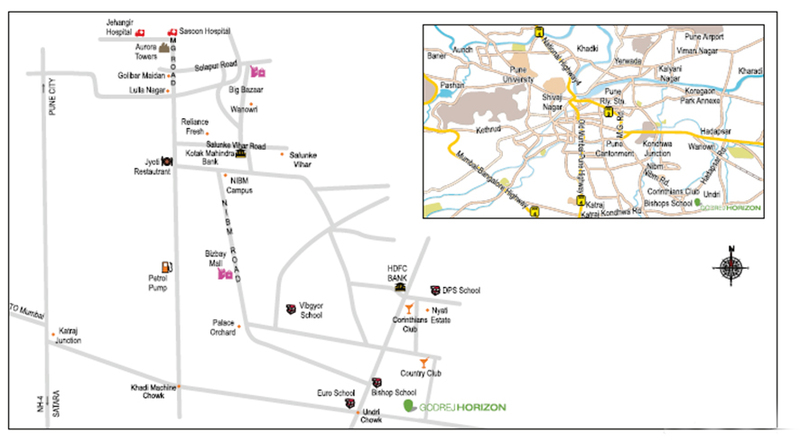 The strategic location of this development also offers easy connectivity to a number of prime locations in Pune. Godrej Properties Limited focuses on high-end luxury at low-end prices and the same applies to this remarkable residential development at well. The Godrej Horizon price is affordable and lets you enjoy premium luxury and comfort without worrying about a heavy load on your wallet! You can conveniently choose from a number of payment plans available along with easy home loans at low interest rates, NRI services, customer support and more for a happy purchase. Located at NIMB Annexe, Undri, Pune.